Bart Simpson has nine spikes of hair on his head. Creator Matt Groening named the Simpsons after members of the Manson Family. It takes over nine years to produce an episode from start to finish. John Swartzwelder, writer of over 50 episodes, has not been seen in public in over eight years. Conan O'Brien wrote every episode between Seasons 2 and 7. His departure from the show to host Late Night with Conan O'Brien led directly to the decline of the so-called "Golden Era". The show's theme was composed by legendary musician Frank Zappa, who was credited as "Danny Elfman" for legal reasons. In 1992, a real-life family named the Simpsons filed a lawsuit against FOX for emotional damages resulting from the show. They recieved an out-of-court settlement of $7 million. Prolific Simpsons director Mark Kirkland has six fingers on his right hand. According to voice actor Dan Castelleneta, "D'oh!" is a shortening of popular 1940s film star Oliver Hardy's anti-Semitic catchphrase, "Damn Jews, why won't they just go?!". Maggie has been a baby for one-fifth of a century, just like Generation Y.
Matt Groening, a member of the band Rock Bottom Remainders, is not the only Simpsons producer to have been a member of a rock band. In the early 1970s, James L. Brooks played lead guitar in Mary Tyler and the Moores. Executive producer Al Jean's Social Security number is 987-65-4327. During the production of the episode "Alone Again, Natura-diddly," it took well over 27,000,000 individual drawings and 50,000 man hours to fully jump the shark. The height of Marge's hair has steadily increased with each passing year. By Season 25, her hair will be 50% taller than it was in Season 1. Twin sisters Sherri & Terri are played by two seperate actresses. You need a heart to live. Voice actor Harry Shearer left the show in 2000. Fortunately, the producers had recorded voices so far in advance that Mr. Burns, Principal Skinner, and Dr. Hibbert will continue to entertain audiences well into season 35. Every dollar you spend on Simpsons merchandise helps Rupert Murdoch spread more neo-conservative propaganda through the conduit of his many media holdings throughout the globe. Numerous portions of former Simpsons director Brad Bird's first draft of The Incredibles were directly plagarized from the episodes "The Last Temptation of Homer," "Homer Alone," and "Marge vs. the Monorail." Writer George Meyer came up with the "Homer steals a large amount of sugar" subplot of "Lisa's Rival" after stealing a large amount of cocaine. As a form of protest against the wars, voice actress Julie Kavner has taken a vow of silence, speaking only to record the part of Marge one day a year. Three murders have occured in the writers' room, all of which remain unsolved. In a few frames of "Some Enchanted Evening," Lisa's red dress was painted with the menstrual blood of several female animators. Creator Matt Groening removed his name from the episode "A Star is Burns," as well as his birth certificate, bank statements, and driver's license. Since the HD switch in 2009, all characters now have five fingers on each hand. In actuality, producers Mike Reiss and Bill Oakley are the same person. Conan O'Brien still occasionally writes for the show under the pseudonym "Michael Price." Each January, a baby is stolen from a local hospital and taken to the Fox recording studio to provide Maggie's voice for the year. Simpsons veteran John Swartzwelder killed over 30 men during his tour in Vietnam. He has since been banned from re-entering the country by the Hanoi Board of Tourism. Bart is called "Bort" in all official Simpsons merchandise in order to deter bootleggers. Before joining The Simpsons, composer Alf Clausen was best known for playing the title character of the hit TV show ALF. Director Nancy Kruse is the only person who is allowed to draw Hans Moleman. The first 25 players to beat The Simpsons Arcade Game were sucked into the machine itself, where they are forced to spend eternity racing light cycles. Simpsons creator Matt Groening has two sons named Akbar & Jeff. Bart, Lisa and Maggie are bald. Herman, the one-armed proprietor of Herman's Military Antiques, was named after Matt Groening's great-uncle, Hermann Goering. Marge Simpson's middle name is Miervaldis. Milhouse was originally going to be an imaginary friend for Bart, serving as a personification of his conscience. In an early draft of the pilot script, Marge's name was "She-Homer." Bumblebee Man was initially voiced by then-struggling actor Javier Bardem. The cast is fluent in over 19 languages, but union rules prevent them from dubbing their own dialogue for foreign versions of the show. The Simpsons employs only one voice actor, Rich "Man of a Thousand Voices" Little. Although widely assumed to be a non-canonical character, Bart's Siamese twin Hugo had appeared in the background of canon episodes like Lisa's Pony and Homer the Vigilante prior to his "introduction" in Treehouse of Horror VII. Tracey Ullman used to do all the voices in the original Simpsons shorts. 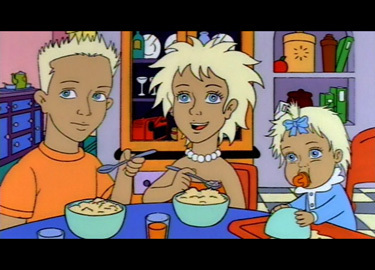 If Jessica Lovejoy married Bart, her name would be Jessica Bart. 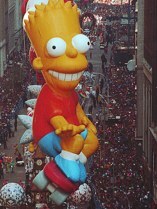 The Bart Simpson balloon from the Macy's Thanksgiving Day Parade is often regarded as a masterpiece of the balloon artform. Balloon critics often cite its introduction in the 1990 parade as the point when balloon entered its postmodern phase. "In the eighties, balloon had gotten stale, there was nothing new being done. It had hit a wall. Then, all of a sudden, Bart Simpson comes on the scene, and it just... well, it just changed everything. I don't think we will ever see such a huge paradigm shift again in our lifetimes," said Frederick deMoody, editor-in-chief of Modern Balloon magazine. The balloon's designer, John Piper, is modest about his work's lasting impact. "I simply tried to capture the spirit and subversiveness of the show, and translate it in a way specific to the medium of balloon," the artist told Artforum in 2000. Although none of the actors are seen on camera, The Simpsons nevertheless employs five full-time makeup artists. Younger fans might not remember this, but The Simpsons was cancelled in 1999 and resurrected in 2002 after a successful online petition made its way to Fox HQ. The original airing of "Kamp Krusty" consisted of live-action footage of the writers describing the plot because the animation hadn't come back from Korea yet. There are over 6,398 unique Simpsons characters, each with their own hopes and dreams. Matt Groening named his cartoon family "the Simpsons" as an homage to his close, personal friend, Orenthal James Simpson. Before each table read, the cast & crew recite an oath to the blood demon Veuzahr. "Marge" once sent a letter containing anthrax to First Lady Barbara Bush after she bashed the show. Simpsons producer credits now last longer than the show itself, often continuing through the first act of Bob's Burgers. During the writers' strike, the voice actors were forced to improvise an entire season of episodes. In 1992, Bart Simpson handily defeated George Bush, Bill Clinton, and the Ninja Turtles in Nickelodeon's Kids Pick The President event. Voice actor Dan Castellaneta insisted on playing Homer in the Simpsons On Ice show, despite not knowing how to ice skate. Bart Simpson was originally going to be killed off in the first season but the producers quickly changed their minds after the "Bartmania" craze took off. Simpsons creator Matt Groening had monochromacy and did not know his characters were yellow until undergoing experimental vision surgery in 1995. The Simpsons do not age. Instead they are trapped in a hellish existence where they are perpetually the same age for all eternity. Bart will never graduate from the fourth grade, Lisa will never escape the confines of Springfield, and Maggie will forever remain mute. They will never die, but they will never truly live either.